Famous for advanced & expert skiing & Corbet's Couloir. Less well known for 40% of its terrain being intermediate blue runs, so plenty for everyone! 35 mins from Jackson Hole airport with flights from 13 major US cities including Dallas, San Francisco & LA for Australian guests connecting from Sydney or Denver, Chicago, NY & Washington DC for UK guests. Jackson Hole is world famous for being "steep & deep" and has an epic average 459 inches of snow each Winter. Experts can try (or take a look at) Corbet's couloir & the long Hoback black runs are a must. 40% of the runs are intermediate & every lift has at least one intermediate blue run (except tram), so you can ski Jackson Hole whatever your level! Jackson Hole ski resort itself is located in Teton Village, which has ski in, ski out & walk to lifts accommodation. The slopes are 20-25 mins from the Town of Jackson where there is additional lodging, shops, cowboy bars, restaurants & lively nightlife. The ski resorts of Snow King & Grand Targhee are also within driving distance. Jackson Hole ski resort what's new? Solitude Station is opening in Winter 2018 / 2019 located at the gondola mid station. This new mid mountain beginner area is perfect for families & includes a snow sports school, restaurant & rentals. More on Jackson Hole's Solitude Station new for 18/19. New Sweetwater Gondola replaces the Eagle's Rest & Sweetwater chairlifts for 2016 /2017. This 2-stage gondola stops at the top of the beginner Eagle's rest area before continuing to the Casper area. From the base of the Casper area, skiers & snowboarders can use the Casper lift to access fantastic cruisers or ski over to the Teton lift for more cruisers & tree skiing. 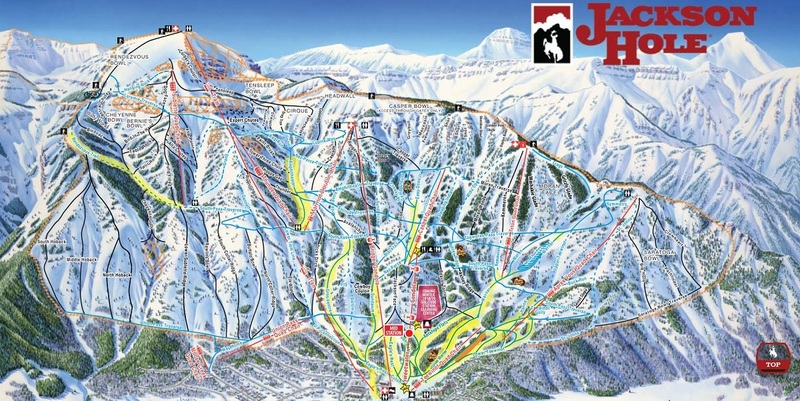 Click on map to view larger version of new 2018/2019 Jackson Hole piste map including the new Solitude Station. Jackson Hole has 3 main areas of the mountain: Apres Vous, Casper and Rendezvous. Apres vous has mostly beginner & intermediate terrain with some black runs off the Saratoga Bowl. The Casper area in the middle of the mountain is great for intermediates with lots of blue ski runs and can now be easily accessed via the new Sweetwater gondola. At the mid station of this gondola is a new mid mountain beginner area called Solitude Station. Rendezvous mountain is home to the infamous Corbet's Couloir, not for the fainthearted and many other incredible black & double black diamond runs including the Hobacks off the Aerial Tram, which whisks you up 4129 vertical feet in just 9 minutes. In Teton Village, the Mangy Moose is famous for its après ski with live music & draught beers. Sample the sushi or gastro pub fare at the slopeside 4 seasons or enjoy the Teton Mountain Lodge Spur or Cascade bar après ski with Teton Nachos, a mountain-size app. In the Town of Jackson, the Cowboy bar or the Wort hotel's Silver Dollar bar are a must for western style entertainment. Snowshoeing in the awe-inspiring Grand Teton National Park are just some of the day trips you can do from Jackson. Teton Thai - small, casual restaurant where the locals go! Mangy Moose for casual burgers, an experience! "Take some tours off the mountain to see nature. We enjoyed the Elk Refuge sleigh ride and the Dusk Nature tour." Drozda 2016.